With the US closed for Independence Day financial markets were quiet yesterday. Most of the European bourses closed slightly lower after a quiet day of wafer-thin trading. Some weak data releases highlighted some of the fears regarding the headwinds facing the global recovery, but this is having the effect of boosting expectations of further central bank stimulus measures limited the falls. One piece of data from China yesterday set the tone, with the HSBC Services PM Index falling from 54.7 to 52.3 last month: the slowest rate of growth in ten months.China has considerable ability to ease further now that inflation is subdued. We believe the prospects for further fiscal and monetary stimulus are high, and to date, the amount of stimulus thrown at the economy remains significantly below the 2008 GFC. With $3 trillion plus in reserve, China has an array of measures that could be deployed. If we stand back and take a look at the 5 year chart of the Shanghai Composite Index, two key factors standout. Firstly, following the critical lows of November 2008 (when the index bottomed out at 1600), the SCI rallied impulsively for 1 year and topped out at 3400. Since then the SCI has corrected within a broad descending wedge formation. Fundamentally, this ties in with the tightening that China had to exert on its economy when inflation got out of control. Secondly, the SCI is now clearly losing downward momentum and bottoming out. This is consistent with our view that stimulus measures will begin to have a positive impact on the underlying economy. We think what has led to a protracted correction in the SCI over the past year, is the fact that Europe, a major export market of China’s is in recession. Stock markets habitually look through recessions (and economic slowdowns) once fully priced in, so we think the SCI has a good chance of reasserting itself to the upside once the stimulus measures take effect and there is less uncertainty around Europe and the US. Also if we take a broader look at the bubble that formed in Chinese stocks between 2005 and 2007, the SCI remains well down from the all time highs of 6000. 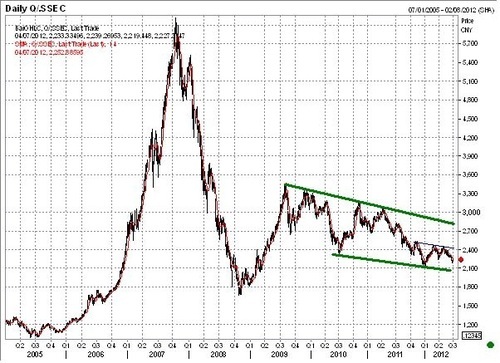 We do believe we will get a meaningful reversal to the upside in Chinese equities sometime this year or in 2013. One problem China will never have is deflation, and unlike Japan, population growth and demographics will not be an issue for many decades. With an urbanisation rate of around 51%, which is still well below Western countries, there is plenty of room for the economy to continue growing over the next 5 to 10 years. It will however be important for the SCI to hold and not take out the lows of late last year at 2100. If the SCI falls below this level, then prospects of an extended correction increases significantly, but this is not our base case scenario. Taking a 10 year look at Germany’s DAX index, one can be excused for thinking that there is no sign of the Eurozone crisis. 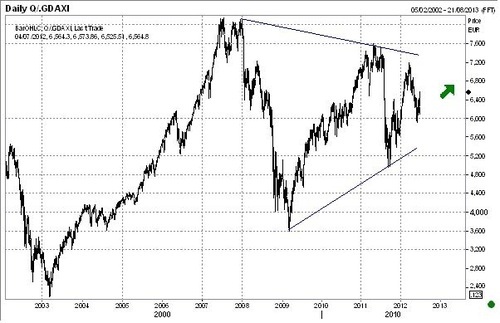 If anything the DAX is still consolidating a multiyear bull market between 2003 and 2008, but unlike China, remains near the all time peak of around 7800. We can put forward a scenario where the DAX could potentially breakout to the upside through overhead resistance and go on and make new highs. For this scenario to happen, a fatal end to the Eurozone crisis will need to be avoided at all costs. Self preservation is a powerful motivation, and given the German economy has been the greatest beneficiary of the euro, we can expect politically they will find a way through the current quagmire and follow a path that lies within their best interests. And the best interests are definitively to avoid a European meltdown. Angela Merkel’s back down last Friday was critical and we believe we will see further concessions made over the coming year. Germans have yet to experience any severe economic pain, which politically has been a impediment to making some sacrifices internally. The fact that Germany’s services sector unexpectedly stagnated in June, ending an eight-month period of expansion as new order intake dropped, will help sharpen attention domestically on the wider European economy, which remains under pressure. The composite PMI for the whole euro area was 47.1 – better than the forecast 46.8 – but crucially remains below the 50 mark separating growth from contraction: and has been for nine of the last 10 months. Talk of further central bank action has also been supportive of gold and other commodities this week, but the increasingly bad economic data is keeping the appetite for risk in check. Gold was little changed at $1,616, but after gaining more than 4% since last Friday and having hit a two-week high of $1,624.70, some consolidation was to be expected yesterday. 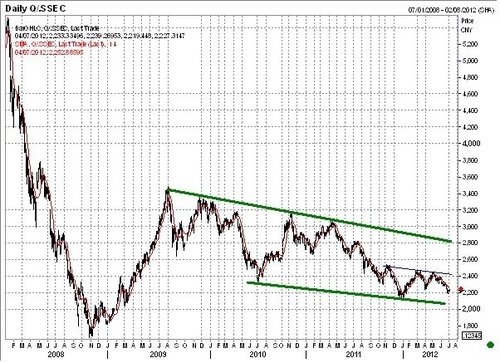 We think there is a strong probability that the multi month correction in gold will end, with the price breaking out to the upside on the back of further quantitative easing as a catalyst. Time will tell, but the chart is now looking highly constructive. 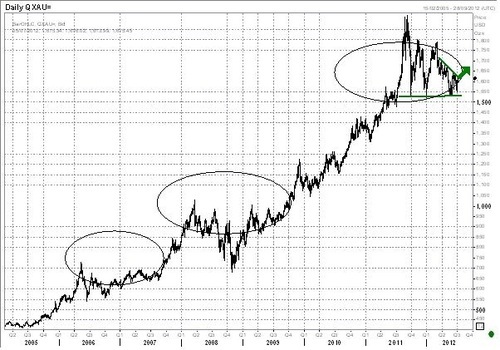 The multi-year chart of gold below highlights the longer term bull market and uptrend which remains firmly intact. What is interesting is the periodic multi-month corrections that have occurred over the past ten years, and we believe this has certainly been the case for gold in the past 18 months, following the highs of $1900 attained last year. 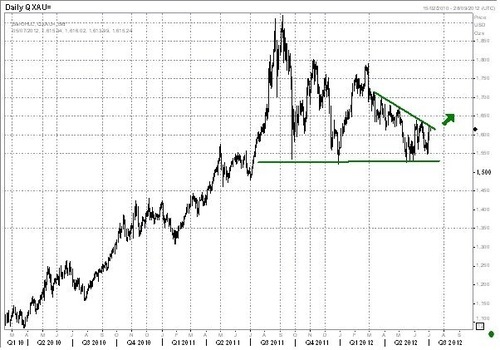 The overall chart structure of gold is bullish near term and in our opinion the prospect of a breakout is now high. Gold stocks look to have made their lows in May, and we believe that we can expect a considerable catch up rally and momentum within the sector in the event that gold reasserts itself to the upside. The euro meanwhile fell 0.2% against the Greenback to $1.2565 due to widespread expectation of an ECB rate cut today. All eyes will be focused on both the European Central Bank and Bank of England tomorrow: We think there is a good chance the ECB will cut rates by 25 basis points and BoE will launch a third round of QE.